So….I have been playing otome games lately and my friend recently game this particular one. 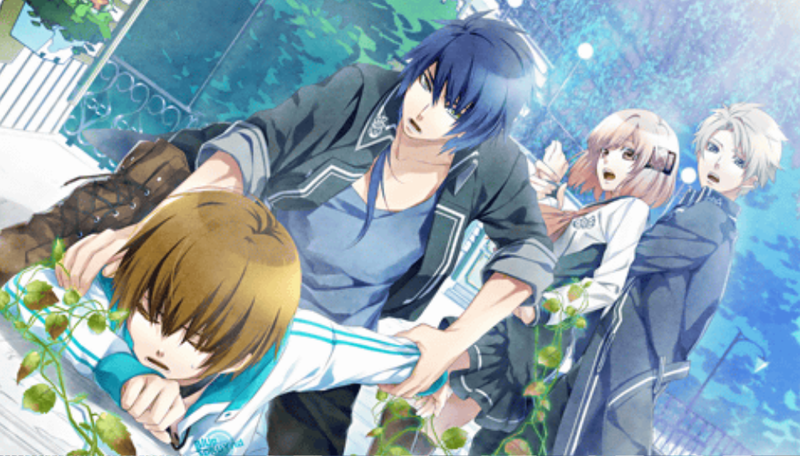 Norn 9 is a otome game that revolves around sci-fi/fantasy. It is set in the future and you start out playing as a young boy named Sorata. Sorata was on a field trip with his school when he suddenly heard a girl singing. No one else seemed to be able to hear it though, which confused him even more. Suddenly he blacked out and when he woke up Sorata found himself in an unfamiliar place. Anyway, Sorata and Koharu are then brought into a meeting room and met the rest of the members. They then decided to take Sorata to the Origin of the World. By the way for future reference, the ship they’re in is called Norn and they’re in an organization called the World. So yeah, the members were suspicious of Koharu though, because she’s wearing their uniform even though you can only get it after boarding the ship. However Koharu only said that a traveller gave it to her so they let it go. Sorata then suddenly realised that they’re flying and passed out from the shock xD. Anyway regardless to who you choose, suddenly the ship was attacked and everyone panicked. Here you get to choose your heroine, so choose carefully because they each have three guys. I’ll go more in detail about what happens next in the next post but basically that was the prologue. Well at least the ones from Sorata’s point of view anyway. It was quite interesting though there were lots of moments where it’s kinda like…..huh? I guess that’s on purpose? Anyway I’ll post the next one as soon as possible and it will be Nanami with Akito’s route since that’s who I chose first. So, today I will be reviewing a game that I’ve recently started. This game is called Amnesia. It is a Japanese otome game, which is a dating simulation game. Okay if you’ve never heard it before, this must sound really weird. Basically, it’s a visual novel game where you play as the heroine, and you get to choose one of the may good looking guys, and develop a relationship with him. Still sounds weird? Well to be honest, I’ve only recently started playing it too, it is quite interesting I must say. In this game, basically the heroine loses her memory for some reason (it differs for each route) and finds herself stuck with a spirit named Orion. Then after you choose a route, they both try to regain the heroine’s memories. 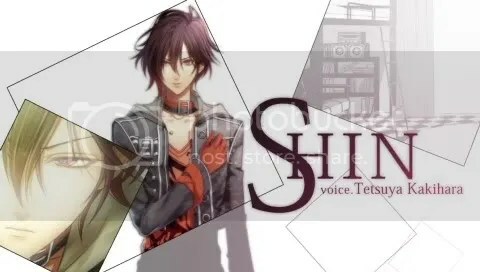 There are 4 initial routes in this game- The Heart World(Shin), The Spade World (Ikki), The Clover World (Kent), and The Diamond World (Touma). Well since I started with Shin, let’s go through that first!~~ Ah! Also, in this game you can choose the name of the heroine, and just to let you know, I named her Ayuka. So then, I’ll be referring to her as Ayuka and not heroine. Okay. Well Shin is my second favourite character, after Ukyou. He’s quite a blunt guy who at first can appear a bit rude. He even calls Ayuka ‘Baka’ (Idiot) quite a few times throughout the game xDD However, he’s actually really protective and he sincerely loves her. Shin’s goal in his route is to find who’s responsible for Ayuka’s lost of memories, and to prove himself innocent. Anyway so later on Shin told her that he knows about her memory loss and that he’s her boyfriend. He hopes that she would be able to regain her memories so she can remember him again. Haha it’s really funny though~ He told Ayuka that they’ve been dating for a year, when in reality they’ve only been dating for 3 months! Sheesh Shin, what were you hoping for when you said that~~ xDDD Oh yeah, did I mention where they worked? Ayuka, Shin and the other 3 guys works part time at ‘Maido no Hitsuji’ which is a maid cafe. If you aren’t familiar with it, basically in Japan they have cafes where the female workers acts as maids and not just a normal waitress. It’s kinda hard to explain actually….. Anyway, I found Shin’s route really interesting because it is similar to a mystery/detective story. Basically before she lost her memories, Ayuka, Shin and some other people went to a resort for a holiday. There, someone had somehow caused her to hit her head, which was the cause of her amnesia. There are 3 suspects- Shin, Touma and Ayuka’s friend, Sawa. This is because the three of them had spent alone times with her at the time and had the opportunity to do it. So, Shin wants to uncover the truth and prove that they are innocent. There are quite a lot of memorable parts of this game, but I won’t be covering them all…..so let’s select a few. The first one is when they went to see fireworks at an abandoned shrine along with Sawa, Touma and Waka (their manager). I found this part interesting because Shin revealed something about his past. He told Ayuka about his father who was a drunk, and one day had accidentally killed someone. Shin was being so sweet here~~ He said how Ayuka and Touma (the three of them are childhood friends) were really good friends to him. He also wants to be different from his father, who is just…..hopeless I must say. So, he wants to work hard so he can succeed. *sniff* I will be rooting for you Shin!! Anyway, I thought that it was just so sweet that Shin trusted Ayuka enough to tell her about his father. In this ending Ayuka and Shin still confronts Touma about the incident. However, the difference is that she refused to remember what happened. I got really annoyed then, seriously don’t protect a guy like him!!!!! Anyway, so the revelation part ends with Touma saying that he’ll probably never see them again. I was relieved for that, nevertheless. Ugh…..I hate this ending so much that I avoided it. So unfortunately (Actually, fortunately), I don’t know exactly what happens. I only know so much from what I’ve read about it. Basically throughout the game Ayuka doesn’t trust Shin and until the end she thinks that Shin is the culprit. Instead, Ayuka chose to trust Touma instead. Bad decision lady!!! Bad decision indeed, since Touma then gave her a drink which he had actually drugged. As Ayuka drank it, she started feeling dizzy which made Orion also panic. Yeah since she didn’t regain her memory, Orion is still there in this ending. Well the last thing she saw is Touma, saying that he’ll give her a never ending dream in which she won’t be able to wake up from. ………….yeah you can see why I avoided it. This ending happens in the middle of the game when they all went back to the resort to investigate. First, there’s a character that you need to know about. His name is Ukyou, and as I said earlier he’s my favourite character! However if you don’t know this game at all….then you won’t understand why I like him I suppose. Not until later anyway. Basically, he’s a mysterious character who somehow seems to know Ayuka well, although she doesn’t know him. He also has a double personality although he remains a mystery until all the routes have been completed. Well in the room , Ukyou then started talking about how this is a bad idea and that he’s dangerous and she shouldn’t be around him. Of course, this made Ayuka really confused. Ayuka and Orion are worried and were thinking that they should leave after all. However, it’s too late!!! Ukyou turns around, revealing his second personality, which I must say has a really scary face, and was holding a knife. He then stabbed her, causing the scene to turn red! Uh yeah, I was surprised. But then it cleared, and Ukyou’s face appeared again. He still had that creepy grin, goodness. Then he said “Sayounara” (Goodbye) and kills her. In which, the scene turns completely red again…………..